The following are just some of the questions we've been asked more than once. Some apply primarily to family parties, as opposed to public events. Please feel free to contact us with additional questions. Email or our contact form is the quickest way to reach us and it may take longer to respond back on the weekend. How much do you charge for face painting and balloons? Many choose to book 2 hours of face painting (or glitter tattoos) and balloons provided by two artists. This cost is $250 total for a family party. One service is $150 for 2 hours. Corporate or public events may be slightly higher. There may be a travel charge. Please see pricing for further info. Why is the body art & balloon combo discounted more than 2 body arts? Balloons appeal primarily to younger kids, whereas body art appeals to all ages...teens and adults included, therefore balloon twisting is discounted a little bit more to account for this. It is still very hectic because kids like to pop them and come back for more, but we are trying to keep prices affordable, especially for families with young kids. We don't have a set stipulation, but it's in your best interest to secure your time slot before someone else takes it. If we are not available, we may recommend someone else. 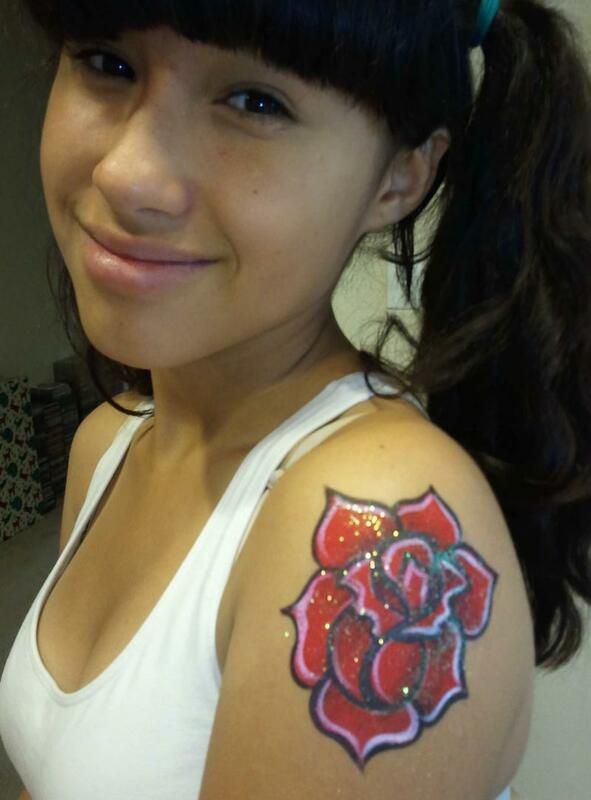 Face painting or glitter tattoos are suitable for what age group? All ages, with tiny kids being optional (read next question also). Adults will likely want to get painted, even if you don't anticipate that... including men. We do not recommend this for an all baby or young toddler party unless it is offered equally for the parents. I will have a lot of babies at my party. Will you paint them? Young toddlers and babies are hesitant about being approached by strangers. If this is the case with a particular child, we are willing to try quickly stamping on product and applying glitter, or painting an arm or leg so they can see what we're doing. All kids must be willing. In general, allow 3 to 5 minutes per design for an average mixed-age crowd, with younger kids taking more time than older (they wiggle!). Impromptu custom requests might take longer and there may be a longer transition time in between younger guests in and out of chair. This is based on a selection of large designs, we can also substitute very simple designs to expedite a long line at a large event. How long will face paining or glitter tattoo designs last? Face paint will not last for more than a day, and less if it is hot out and/or kids are in a jump house. Glitter tattoos will last for several days, but may be removed sooner if desired. Just a small space, about 5 x 5 ft, to set up with some extra space, if possible, for guests to congregate. We have everything we need, but it's preferable to have shade if outdoors, even in cool weather. Many customers choose to book 2 hours regardless, and we can tailor the services to the number of guests at the time of party (fewer guests = more/larger designs, and vice versa) if you want to adhere to that time frame. You may also ask to extend your time frame at the time of the party (this is subject to availability, but usually works out). We do not need an exact head count, but if you know your party will be large in general, we suggest booking extra time beyond 2 hours with the option to downgrade at time of party if necessary. Mention this beforehand if you think this is a good option for you, subject to pre-approval. Who will be interested in balloon twisting? Balloons are not recommended for young babies, and adults and teens are usually not interested; but everyone in between. They are quick and provide entertainment while kids are waiting for face or body art. What happens if you finish early.... or go over your designated time? We can provide mutiple designs and/or balloons and/or do adults who have not been painted. We don't charge for a little bit of overtime for children who arrive late. However, if it gets chaotic, you may incur charges for each 15-minute increment of overtime. This is up to you to deline or accept. More info in the fine print of reservation page. Do you dress up as a clown, fairy, or other character? At this time, we are not providing clowns or characters. However, if this is important to your child I may be able to recommend another company. Check, cash, money order, PayPal, all credit cards. However, do not mail cash to pay a deposit. We can send invoice for on-line payment, etc.